Back in January, the Samsung Galaxy A8 Plus (2018) was launched in India exclusively on Amazon. Keeping up the tradition of its mid-range A series, the smartphone boasts a design and certain features that are reminiscent of Samsung’s flagship Galaxy S8 and Note 8. The highlight of the Galaxy A8+ is its Infinity display with an 18.5:9 aspect ratio, dual front cameras, IP68 dust and water resistance, Bixby support, Always-On display, and Samsung Pay. The A8 Plus 2018 featuring a premium metal and glass construction is also Samsung’s first smartphone to pack dual selfie cameras. Priced at Rs. 32,990, the Samsung Galaxy A8+ directly competes with OnePlus’ hot-selling 2017 flagship, the OnePlus 5T. 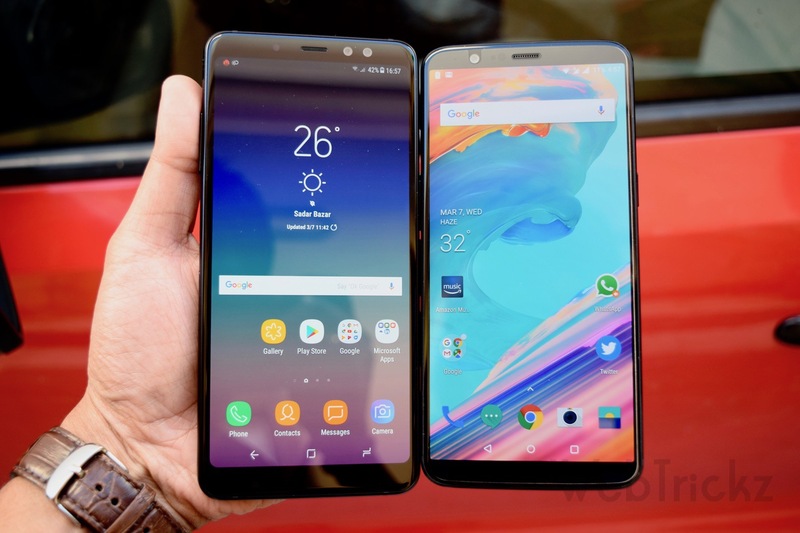 Barring the pricing, both the smartphones share few common specifications such as a full view display and offer some distinctive features as well. A brief technical comparison below will give you an idea of what’s different and common between these two devices. Let’s now see how the Galaxy A8+ powered by Samsung’s Exynos 7885 processor fares against the OnePlus 5T running on Snapdragon 835. Below you can find a host of synthetic benchmark tests comparing the device’s performance. Note: The tests were performed while all the background apps were closed. It’s worth noting that the above benchmark tests only evaluate the hardware performance of your device. They indicate how fast your device can perform in terms of CPU, graphics and overall performance as compared to other devices. Benchmarks don’t always reflect the real-life performance and don’t guarantee the best performance. However, in this case, it’s certain that the OnePlus 5T will heavily outperform the A8+ in most scenarios because it packs a powerful processor and runs on near stock Android. Having said, it would be interesting to see how the OnePlus 5T scores against the newly launched Samsung Galaxy S9 that’s powered by the Exynos 9810 SoC in India and Snapdragon 845 in the US. 5T still is the winner? Can\’t believe.